Blue Group, leading specialist provider of materials processing equipment for the quarrying and waste recycling industry has implemented BigChange’s 4-in-1 Mobile Workforce Management Platform across its Service division. 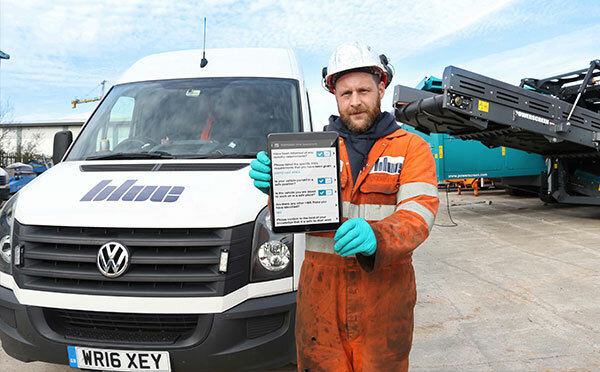 The all-in-one system is fully integrated with Blue’s SAP Business One ERP system and provides intelligent job scheduling, an Android mobile app for service technicians and real-time tracking of all vehicles across the fleet. The solution was implemented by BigChange in partnership with Blue’s SAP Business One integrator, Frontline Consultancy. Blue Group chose BigChange as part of a digital transformation project to enhance customer service and automate the warranty claims process. The BigChange system has revolutionised the booking and scheduling of planned and reactive maintenance, connecting customer service teams with mobile technicians in real-time. Intelligent scheduling has replaced the use of Outlook and jobs raised in SAP are instantly synced with the BigChange platform. It allows advisers to quickly offer customers urgent maintenance slots at a time and date to suit them, considering real-time technician and equipment availability, proximity to the customer and live traffic data. The intelligent scheduling engine ensures maximum flexibility for the customer whilst minimising travel time and distance, driving fuel savings and a reduction in emissions. Real-time visibility of the operation ensures customer service advisors are empowered to answer customer questions in an instant and automated estimated time of arrival (ETA) alerts by email and text message ensure customers are always fully informed. Blue Group supply, install and maintain crushers, screeners, shredders, material handlers and recycling plants for leading industrial users across the UK and Ireland from 8 strategically placed sites. They provide an industry leading maintenance offering to maximise uptime and to keep machines running efficiently. The group turned over in excess of £100 million in 2017. The BigChange technology is saving hundreds of thousands of pieces of paperwork annually, and has replaced an electronic pen and paper based legacy system with digital workflows running on rugged waterproof Samsung Android Tablets. Each day, Blue technicians complete an electronic walkaround check, logging and photographing any defects that are managed to resolution via integrated fleet management functionality. On starting their timesheet, technicians have instant access to their jobs for the day with detailed information about each customer, site and machinery. Job data is automatically loaded into the integrated sat-nav with turn-by-turn guidance and live traffic updates. On arrival, the app takes care of risk assessments and method statements and guides the technician though equipment specific service workflows, capturing a detailed audit trail. Photos are captured during the service process for added proof of service. On completion, customers automatically receive electronic job-cards via email, proactively confirming completion. This instant sync with the back-office means no ‘paperwork’ needs to be returned for processing and allows Blue group to instantly raise warranty claims, avoiding any delays and boosting cashflow. The system is also delivering duty of care benefits for lone workers, providing confirmation that all engineers have returned home after their jobs.